Forbes Guthrie has done it again! 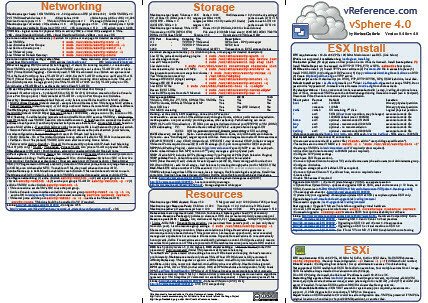 His wildly successful VI3 reference card is now available in vSphere format. Head over to his site, vReference, and download your copy today. Be sure to thank him for his hard work! I for one appreciate all that he does. Thanks Forbes and I look forward to meeting you in a few weeks. Jason, thanks for the kind words. Look forward to meeting you too. Disclaimer: The opinions expressed here are my personal opinions. Content published here does not necessarily reflect the views and opinions of my employer. boche.net - VMware Virtualization Evangelist by Jason Boche is licensed under a Creative Commons Attribution-Share Alike 3.0 United States License. © 2019 boche.net – VMware vEvangelist · Proudly powered by WordPress & Green Park 2 by Cordobo.